It seems that Bioshock Remastered, Bioshock 2 Remastered, and Bioshock Infinite: The Complete Edition will soon all be released separately. 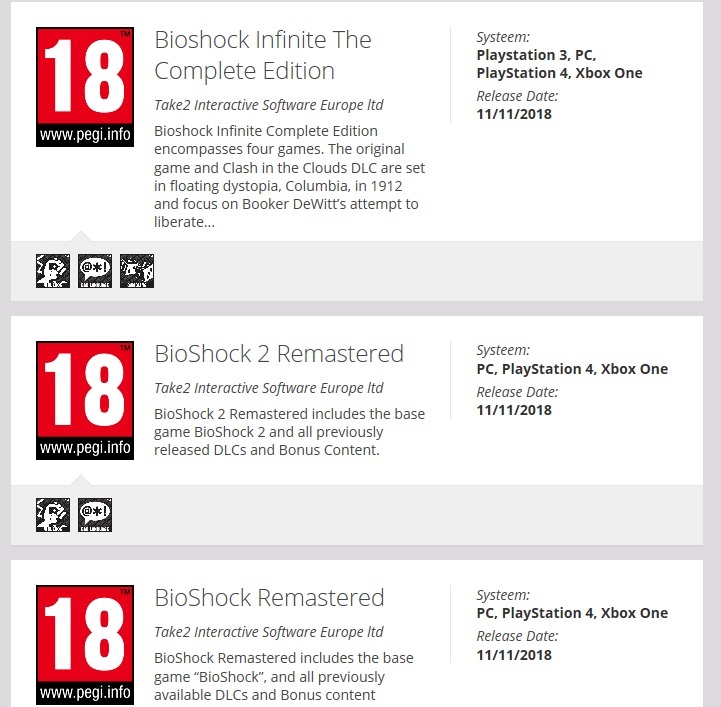 As spotted by Gematsu, all 3 Bioshock games recently received individual PEGI ratings, and it appears that Take-Two intends to release the titles individually. Currently, these games are only playable by obtaining Bioshock: The Collection, which was released back in 2016 for PC, Xbox One and PS4. It’s been nine years since Irrational Games and 2K took you on a terrifying journey to the depths of the underwater city of Rapture with BioShock. Five years since you returned to Rapture in BioShock 2. Three years since you grabbed a skyhook and sailed across the floating city of Columbia in BioShock Infinite. And on September 13, 2016 (September 15 in Australia and September 16 internationally), you can relive these award-winning adventures or experience them for the very first time remastered for current-gen consoles and digital PC with BioShock: The Collection. We will update as soon as we learn more about these individual Bioshock releases.